Plantains can be used in all stages of ripeness, depending on the recipe. Green plantains, and sometimes yellow, can be difficult and tricky to peel. 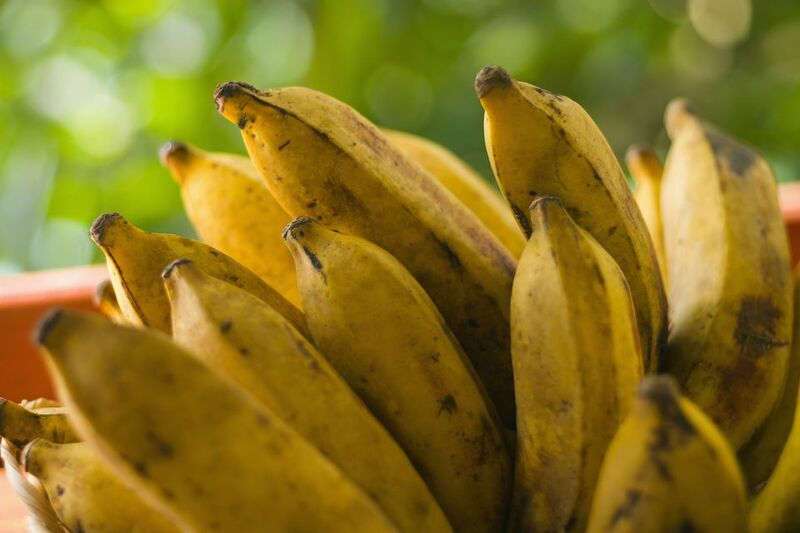 While they look like bananas, you won't be able to easily peel them with your fingers in the same way. You will need a cutting board and a sharp paring knife to begin. The peel comes off easiest if you pull across the diameter of the fruit rather than down the vertical ridges. The technique shown here can be used for both green and ripe plantains. Before you begin peeling a plantain, bring it to room temperature. If you've stored your plantains in the refrigerator, the cold temperature can make it twice as hard to peel. One trick to use is to soak the plantains in hot tap water for a few minutes to warm them up. After all, you will be cooking the plantains in whatever recipe you are using, so starting with the fruit warm will be fine. Place the plantain on a cutting board. Cut off the ends of the plantain and discard the tips. This is a step that is definitely different from peeling a banana, but you will need the ends of the plantain to be open in order to peel it. Hold the plantain firmly. Using the tip of the knife, slit the peel along the length of the plantain. Only cut as deep as the peel is thick. For the easiest peeling, now make a cut in the middle around the circumference of the plantain. If you don't need the plantain whole, you could simply cut it in half. If your plantain is green, you may need to slide the knife just under the edge of peel, without cutting into the flesh, to help loosen it. Remove the plantain peel, peeling it side to side rather than lengthwise. It will come off in sections. You may need to use the knife at the edge of each section to help loosen it from the flesh. A green plantain's peel will be stiff, while a yellow plantain's peel will be pliable. Don't worry if a few small chunks come off with the peel and use your knife to ​remove any peel remnants left on the flesh. Prepare your peeled plantain for the recipe you are making. For example, you can cut the peeled plantain into rounds to make tostones or patacones, which are twice-fried plantain chips. You can slice them lengthwise for tajadas, which are sweet and savory fried ripe plantain strips, or bakabana, which are Surinamese fried ripe plantain strips served with a spicy peanut dipping sauce. Recreate the Puerto Rican jibarito sandwich made with lengthwise sliced and fried plantains that are then mashed and fried again. You can also try your hand at aborrajados, which are Colombian cheese-stuffed fried ripe plantains.